Android is going strong in the mobile OS front and has left Apple iOS far behind in terms of usability options on the go. 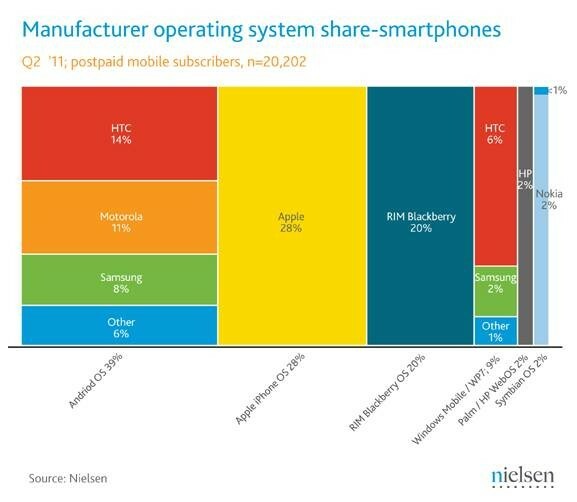 The Android mobile OS has a market share of 39% in US and Apple is closely following it up with a share of 35%. The latest league of mobile phones from Samsung and LG are powered on Android 3.x platform. The new range of Android phones offer supreme class usability options to the valued set of customers. A user can video call using an Android powered device along with accessing internet with utter ease or socializing without any constraints at all. The mobile OS market has become supremely competitive with Nokia planning to launch its dedicated range of smart phones on MeeGo mobile platform on the go. The users should act in a methodical manner while trying to gain from the smart phone operating systems on the go. Unlike iOS the Android platform offers higher number of free apps and Google is planning to launch dedicated APKs to support various Android devices. Apple is running the tablet segment OS at the moment and day is not far when Android might just sneak ahead of Apple in that front too.